Global demand for texturized vegetable proteins is expected to grow at a significant rate during the forecast period, 2018-2028, mainly reinforced by the escalating health trend worldwide. As awareness regarding healthy lifestyles increases, limited fat & carbohydrate content in food is becoming a major point of contention in diets across all age groups. Additionally, along with animal-derived proteins such as whey, casein and others, soy proteins are preferred by athletes, being a rich protein source. Texturized soy proteins are considered as one of the best substitutes for meat products, finding applications in meat analogues and extenders. The rising preference for meat substitutes is therefore expected to directly influence consumption of texturized vegetable proteins, thereby supplementing growth of the market. As these food items deliver higher amount of nutrition, preference for meat substitutes in diet plans is rising, which is a promising avenue for higher sales of texturized vegetable proteins. According to the report by Future Market Insights, the global texturized vegetable protein market is projected to expand at a CAGR of 4.9% during the period of forecast, 2018-2028. Key market players are focusing on entering new markets by means of collaborations and partnerships with a view to reinforce their product lines. Few of the key players profiled in this research study include ROQUETTE FRERES S.A., CHS, Inc., Archer Daniels Midland Company, Cargill, Inc., E.I. du Pont de Nemours & Co., MGP Ingredients, Inc., Sonic Biochem Extractions Limited, Sotexpro, BENEO GmbH, Victoria Group, Shandong Yuxin Soybean Protein Co. Ltd., Crown Soya Protein Group, among others. Being rich in proteins and fibrous material, texturized soy proteins are a widely used ingredient that enhance the nutrition of the meal and are largely used in several food products, including, but not limited to, snacks and functional bars, ready meals, meat analogues and extenders, among others. The consumption of texturized soy proteins is high among older population, lactating women, pregnant women as well as children. Their demand is expected to grow at a stellar rate in the coming years owing to their wide adoption in meat and poultry products. This further helps in enhancing nutritional value of the food item by providing more protein content and reducing fats. These factors have spurred the consumption of texturized soy proteins worldwide, whose sales are expected to reach a value of around US$ 1.4 Bn by end of analysis period. The increasing sales of texturized soy proteins is poised to largely contribute to the growth of the global texturized vegetable proteins market in the coming years. The global market for texturized vegetable proteins is characterized by growing number of regional players as well as presence of international players. Increasing collaborations with regional players to gain hold in the local market have been observed. 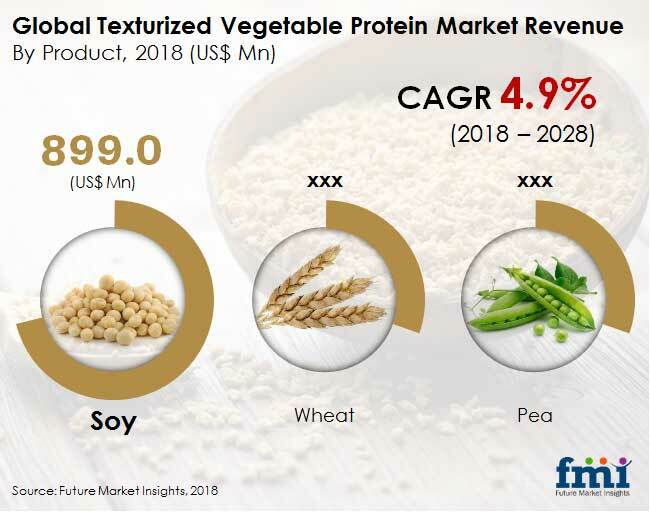 Additionally, regional markets, especially in Asia Pacific, are expected to showcase high growth potential owing to increasing preference for texturized vegetable proteins in the region. The growing changing consumer demand and the lack of growth in developed markets in the recent years is driving the form segment to accelerate its innovation and new product development cycle to tap into faster growth categories. The number of innovations in last few years within the food and beverage industry is been fueling at an accelerated rate and is expected to maintain the same during the forecast period. The plant protein ingredient is the new innovation which are available in fractionated concentrate and isolates. This whole food ingredients contribute texture, flavour, color attributes to the food and beverage final products. Future Market Insights offers a 10 year forecast for the global texturized vegetable protein market between 2018 and 2028. The report also includes macroeconomic indicators along with an outlook on texturized vegetable protein for the global market. The study demonstrates in-depth analysis of the key market dynamics, which are expected to influence the market performance in the long run. The report also comprises the study of current issues with consumers and opportunities for texturized vegetable protein products. The report also offers updates on recent trends, key drivers and restraints, volume and value forecasts, and various opportunities for manufacturers operating in the global and regional texturized vegetable protein markets. After an extensive study of the global texturized vegetable protein market, it has been noted that food processing industry has highly influenced this market in the past, and is expected to account for a considerable demand for texturized vegetable protein throughout the projected period of 10-years. We have observed that stringent standards by regulatory bodies across the globe has created a major impact on the global texturized vegetable protein market. The report focuses towards developing products that are associated with various health benefits in order to leverage opportunity arising from growing number of health conscious consumers worldwide. After examining this market thoroughly, our analysts have arrived at a conclusion that the key players operating in this market are focusing on enhancing production capacity and innovation in terms of various forms and value added products that are healthy and also find its way in a plethora of different applications. According to the report, the market concentration of key players in the global texturized vegetable protein market is increasing continuously, both on vertical as well as on horizontal levels. Producers of texturized vegetable protein are entering into mergers and acquisitions in order to increase their production capacity. In order to provide users of this report with a comprehensive view of the market, we have included detailed competition analysis of the key market players and strategic overview. The dashboard provides a detailed comparison of texturized vegetable protein manufacturers on parameters such as total revenue, product offerings, and key strategy. The study encompasses market attractiveness analysis by product type, form, end use, distribution channel, and region. The report includes texturized vegetable protein market company profiles and the revenue generated from the companies across North America, Latin America, Western Europe, Eastern Europe, Asia Pacific excluding Japan, Japan and the Middle East & Africa. By product type, the global texturized vegetable protein market is segmented as soy, wheat and pea. Texturized vegetable protein produced from soybean is the predominant segment and is expected to account for over 86% of the overall market in terms of revenue. By form, the market is segmented as chunks, slices, flakes and granules. Furthermore, by end use, the global texturized vegetable protein market is segmented into household, commercial and industrial. By distribution channel, the market is segmented as direct and indirect channels. For the calculation of revenue collection of average regional prices were obtained through primary quotes from numerous texturized vegetable protein manufacturers, retailers, and distributors. All key end users have been considered and potential applications have been estimated on the basis of secondary sources and feedback from primary respondents. Country demand patterns have been considered while estimating the market for various end users of texturized vegetable protein in the different regions. Top-down approach has been used to estimate the texturized vegetable protein market by countries. Global market numbers by source have been derived using the bottom-up approach, which is cumulative of each country’s demand. The market has been forecast based on constant currency rates. In addition, it is imperative to note that in an ever-fluctuating global economy, we not only conduct forecasts in terms of CAGR but also analyze on the basis of key parameters such as year-on-year (Y-o-Y) growth to understand the predictability of the market and to identify the right opportunities. Also, another key feature of this report is the analysis of all key segments in terms of absolute dollar. This is traditionally overlooked while forecasting the market. However, absolute dollar opportunity is critical in assessing the level of opportunity that a provider can look to achieve, as well as to identify potential resources from a sales and delivery perspective in the global texturized vegetable protein market. 16.3.5. E.I. du Pont de Nemours & Co.
16.3.11. Shandong Yuxin Soybean Protein Co. Ltd.